خاکساری, علی. (1395). تخمین مدل تأثیر توسعه حمل و نقل ریلی بر رشد اقتصادی کشور از سال 1389- 1350. پژوهشنامه حمل و نقل, 13(2), 10-25. علی خاکساری. "تخمین مدل تأثیر توسعه حمل و نقل ریلی بر رشد اقتصادی کشور از سال 1389- 1350". پژوهشنامه حمل و نقل, 13, 2, 1395, 10-25. خاکساری, علی. (1395). 'تخمین مدل تأثیر توسعه حمل و نقل ریلی بر رشد اقتصادی کشور از سال 1389- 1350', پژوهشنامه حمل و نقل, 13(2), pp. 10-25. خاکساری, علی. تخمین مدل تأثیر توسعه حمل و نقل ریلی بر رشد اقتصادی کشور از سال 1389- 1350. پژوهشنامه حمل و نقل, 1395; 13(2): 10-25. تن-کیلومتر، مسافت پیموده شده توسط قطار و تعداد مسافر جابه­جا شده توسط بخش حمل­ونقل ریلی تأثیر معنی دار مثبت و گازوییل مصرفی در بخش حمل­ونقل ریلی تأثیر معنی­داری بر رشد اقتصادی کشور ندارد. این مطالعه با استفاده از نرم افزار EViews انجام شده است. Rail transportation, as link between demand and supply centers and the maintaining factor for economic and social activities within a country, is important from two dimensions: national development and final prices for goods and services and has a key and essential role in almost all economic processes of a country. Therefore, a precise and comprehensive attention to each one of the rail transportation infrastructure elements considers being main components of reaching growth and development goals of a country. Iran is no exception, in which with 1648195 square km its economic development has been seriously affected by its rail transportation infrastructure development. This paper is aimed to review the effect of rail transportation development of Iranian economic growth in the period of 1972-2010. In order to estimate the model the Vector Autoregressive has been used and for review of rail transport development factors such as the amount of load in tons times km, distance in person times km, number of passengers, and diesel consumption were used. The results from estimating the model show that load in tons distance in person time’s km, number of passengers have positive impact and diesel consumption has negative impact on economic growth. The study was done by using E-Views software. Schmertmann, G.R., V.E. Chourey - Curtis. Johansson, R.D. ,and Bonaparte ,R. ,(1987). ̎ Design charts for Geogrid-reinforced soil slopes. ̎ Proc. Geosynthetics ̛ 87,Vol.1, Industrial fabric assn. Int.,st.Paul,Minn., pp. 108-120. Budhu, M., ̎ Soil mechanics and foundations ̎ , 2nd Edition(2008), USA,John Wiley & Sons. Yang, K., J. Zornberg (2012). "Stress distribution and development within Geosynthetic-reinforced soil slopes." Geosynthetics International 19(1): pp. 62-78. Zheng, H., G. Sun (2009). "A practical procedure for searching critical slip surfaces of slopes based on the strength reduction technique." Computers and Geotechnics 36(1):pp. 1-5. Zheng, H., G. Sun (2009). "A practical procedure for searching critical slip surfaces of slopes based on the strength reduction technique." Computers and Geotechnics 36(1): pp. 1-5. 9. 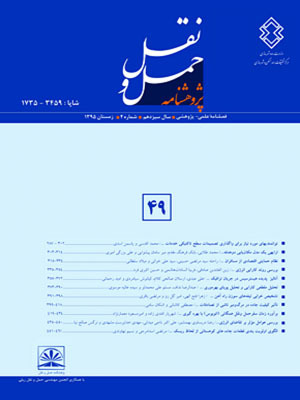 داس. براجا. ام. (1941)، "اصول مهندسی ژئوتکنیک"، شاپور طاحونی، جلد اول، فصل 6 و فصل 8 .